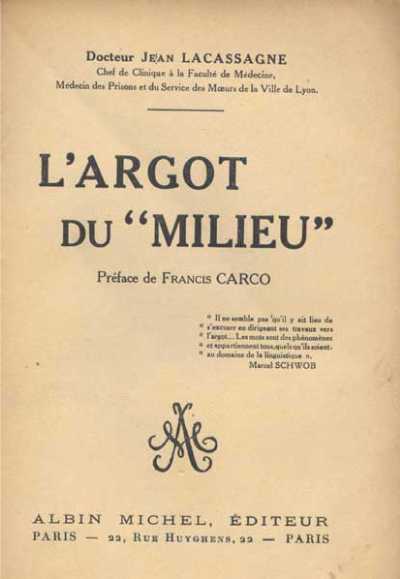 L'Argot de "Milieu" was a groundbreaking and influential dictionary of criminal and low-life French slang, born of the fascination with crime and criminals that had swept early 20th century France in the wake of modern advances in forensics that had allowed, for the first time, the tracking, apprehension, and prosecution of criminals using scientific methods. 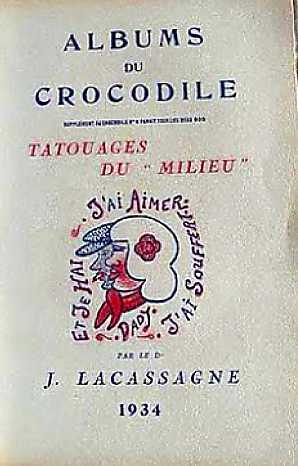 Author Jean Lacassagne (1886-1960), who also wrote under the pseudonym, François Seringard, was the son of the great Lyon forensic criminologist, Alexandre Lacassagne (1843-1924), was head of the Lyon prison medical service, and took a lifelong interest in the darker side of human nature, conducting many studies of French criminal subculture. This book was reprinted and revised several times but the first edition, with its striking color illustration by French painter, illustrator, and engraver André Dignimont (1891-1965, and known for his stylish erotica), is scarce. Lacassagne fils became the doctor of a regiment during the First World War, and received his Ph.D. in 1916. He was also one of founders of l'Association républicaine pour favoriser les études médicales 1923-1924, becoming one of the most active members. He became a knight in the Legion of Honor in 1925. As Clinical Director at Antiquaille he was a specialist in venereal diseases, treating prostitutes and detainees. In 1945 he received a medal from the prison for twenty five years of service. Like his father, he was extremely interested in criminal anthropology. He published articles and books inspired by his meetings and correspondence with criminals. He observed their tattoos, studied their slang, investigated their history, psychology, and collected their reminiscences. Writer of the Preface, Francis Carco, fantaisiste poet, novelist, and art critic, published several works in Parisian argot depicting the street life of Montmartre. LACASSAGNE. Docteur Jean. 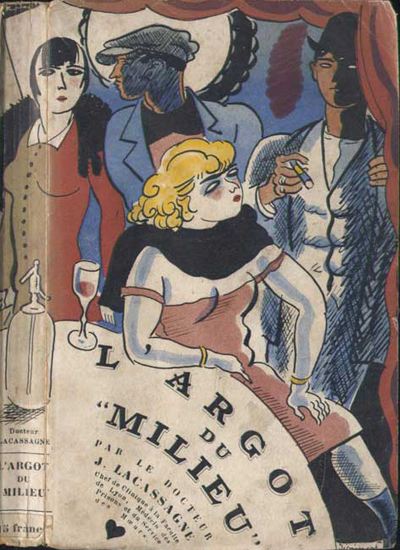 L'Argot du "Milieu." Préface de Francis Carco. Paris: Albin Michel, n.d. . First edition. Octavo (186 x 119 mm), xxii, 293,  pp. Pictorial wrappers, illustrated by André Dignimont. Reprinted in 1935, 1948, 1951, and 1955. 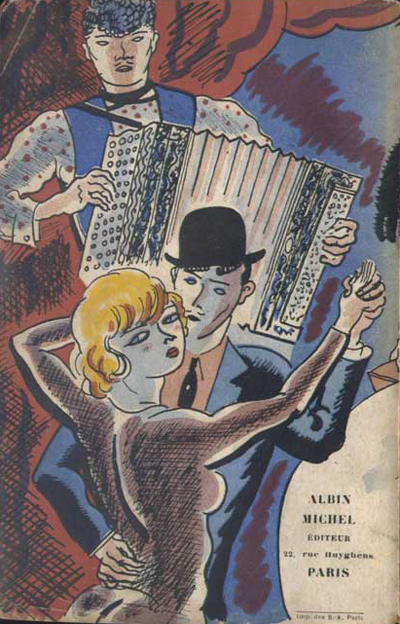 The edition of 1935 reproduces the original wrapper illustration but with the title text design revised. 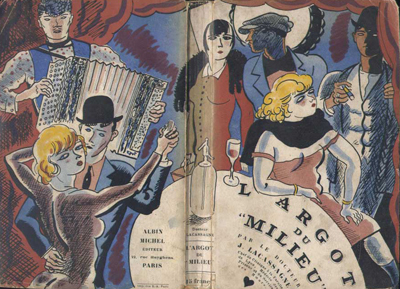 Images from L'Argot du "Milieu" courtesy of Justin Croft Antiquarian Books, with our thanks. Mais, ou sont les exemples?? ?